Capsule Summary: The 4077th is forced to bug out but Hawkeye, Margaret, and Radar stay behind to care for a wounded soldier who can’t be moved. I’ve mentioned several times that I randomly pick an episode to review each week. In the past, whenever an hour-long episode was randomly chosen, I skipped it in favor of a regular episode. It’s often hard to find time to watch and review an episode each week, which means an hour-long episode would be even more difficult to fit into my schedule. I decided to review an hour-long episode this week, however, and “Bug Out” was the episode randomly selected. It’s the second of five episodes that originally aired on CBS as hour-long specials and were later split in two for syndication. That’s how I originally saw the episode on FX back in the late 1990s or early 2000s. I actually can’t remember whether or not I saw both parts of “Bug Out” on FX at the same time. It’s entirely possible that I saw Part 2 first and later caught Part 1. Perhaps I saw Part 1 first and then eventually managed to see Part 2. Or maybe I actually did see them both back-to-back. While rewatching “Bug Out” on DVD, I noticed several scenes during the second half that didn’t seem as familiar as the rest of the episode. That suggests I may have seen Part 1 on FX more than I saw Part 2. Specifically, I don’t recall the lengthy scene involving the Korean women in the building and Klinger losing his entire collection of dresses. I’m guessing it was edited down for syndication. Despite the fact that this is a double length episode, not all that much happens during “Bug Out.” I think a little too much time was spent on the bug out rumor rather than the bug out itself. It’s not until 14 minutes into the episode that the bug out starts. There’s a short but impressive sequence of tents being collapsed, equipment being loaded onto trucks, and patients being moved. I’d love to know more about how the scene was shot. Was it heavily choreographed? Were the tents collapsed more than once? The shot of the mess tent being collapsed involves at least a dozen people. For all the work that went into the bug out, I’m curious exactly how the 4077th was supposed to set up a new camp when so much was left behind. 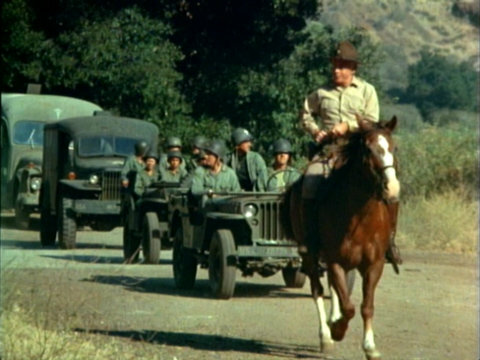 From what I’ve read, real MASH units during the Korean War had to be able to break down and move out in just six hours. What did that mean? Did everything go? In “Bug Out,” we see the tents taken but none of the framing, the flags but not the flagpoles, the surgical tables from the OR but not the light fixtures. Of course, just because we don’t see truckloads of construction material and electrical equipment doesn’t mean it wasn’t there. Most of the episode and the bug out is played for laughs, despite the seriousness of the situation. Hawkeye and Margaret discuss their fears of encountering the enemy, a glimpse at how their relationship will develop. Watch Margaret’s face while Hawkeye and Radar leave for Rosie’s. They’re joking. She looks terrified. Both B.J. and Colonel Potter expressed concern about Hawkeye staying behind but nobody said anything about Margaret or Radar. It’s odd that Frank didn’t put up a fight about Margaret being in danger. Or Colonel Potter, for that matter. Did anyone other than Klinger even notice that Radar ran back to join Hawkeye and Margaret when the convoy left? Colonel Potter leading his troops. These two episodes were the first produced during Season 5 which means they were the first episodes produced without Larry Gelbart, who departed M*A*S*H at the end of Season 4. Gene Reynolds took over as executive producer and was credited as such at the end of the opening credits throughout Season 5. Also added to the opening credits starting with this episode was William Christopher. Frances Fong played Rosie in this episode, taking over for Shizuko Hoshi who originated the role in “Mad Dogs and Servicemen” during Season 5. Fong returned in “Fallen Idol” during Season 6 before Eileen Saki took over as Rosie in “A Night at Rosie’s” during Season 7. Saki is also in “Bug Out,” credited as Korean Woman. She’s the madam who argues with Colonel Potter and B.J. During the first scene, B.J. calls out to one of the men digging the latrine named Salkowitz. It looks to me like Jeff Maxwell nods in response. That means Igor had three different last names over the course of the series: Maxwell, Salkowitz, and Straminsky (which I believe was first used in “Depressing News” during Season 9). Colonel Potter giving Margaret a ride on Sophie is a nice moment, even if they don’t go very far. Also, notice how Hawkeye ignores the jeep carrying B.J., Frank and Father Mulcahy in favor of a seat in the jeep filled with nurses. And I do believe this episode has a lot of trimming throughout in syndication – I’m guessing they were probably trying to fit the whole thing into a half hour, but were unable to. I really like this episode. I don’t know why, but there’s something in there that twigs with me. I think that the only reason why they spent so long on the rumour was to make it even more ironic that there was actually a bug out. And well done finding time for spotlighting this episode, RJ. Good luck doing GFA! A very memorable line from this episode is from Klinger. Klinger lighting up a cigar: A good cigar is like a beautiful chick with a great body who also knows the American League box scores. Who thinks up lines like that?? Sheer genius. Agreed 100%. I love that line and it makes me laugh everytime. that must be a scene that’s been cut out for syndication; I don’t remember ever seeing it when I’ve seen this episode on ME TV. But then, I haven’t seen it in a while. The reference to the latrine-digger Salkowitz was a shout-out to Sy Salkowitz, who was the President of 20th Century Fox television at the time. It was probably not intended to be a permanent part of continuity. This was always an issue with the entire series – a MASH unit consisted of about 200 people, the majority being support for the relatively small contingent of medical personnel. But in the TV show, where were they? True, it would be economically and logistically unfeasible to include such numbers in every episode, but they certainly should have been present when events required them. When a general assembly is called (address by the CO or a visiting dignitary, mandatory calisthenics, etc. ), everyone whose job does not require their presence at the moment is supposed to attend; yet in MASH you rarely see more than two or three dozen people in these scenes. A MASH unit included construction workers, electricians, mechanics, radiomen, drivers, etc., but we never see them. This would be acceptable were it not for the fact that we see doctors and nurses performing these tasks. Why was Hawkeye, who admits he has no mechanical aptitude, repairing a gas heater in the nurses’ quarters? Why were nurses working to secure the water tower during a wind storm? Why do Radar and Klinger try to repair the radio and PA amp? Where were all the support personnel who should have been doing these tasks? The most egregious example of this is the episode where the surgeons want a cement slab for the OR (we’ll not discuss what they had for the years before this episode nor the question of whether they will pour a new slab at each new location when they bug out) – where are the construction personnel?! A surgeon’s hands are his instruments, they are the heart of the MASH; are you actually going to risk damage to them by having the surgeons do manual labor like mixing and pouring cement? Did anyone notice the scene with Mulcahy and Potter in the tent when Potter’s singing? Mulcahy goes to turn on the shower and even braces himself for the cold water, but nothing happens. He tries a few more times and kinda looks around funny, and even acts like the water was hitting him. It’s pretty funny and must have been William Christopher responding to a failure if the shower mechanism during filming. I wonder if they left it in on purpose or just didn’t notice during editing. The blessing scene is the funniest part of this episode. I wonder if that dog barking and running after Hawkeye says “Oh to be in England now that war is here” was scripted or not. It seems to run dangerously near the spot where the pyrotechnics went off a few minutes earlier. Loved the episode. Just one thing I didn’t get. When the lights go out in the OR, Margaret says “Pierce stop that!” But what was he doing? I love this episode, but it seems like so much more could have been done with it. 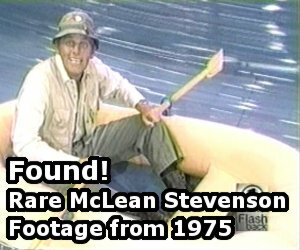 I remember watching this on CBS as a nine-year-old and thinking how cool it was that M*A*S*H was finally going Mobile. But of course, by the end of the episode, everything was back to normal. I really wish we had gotten to see the 4077th set up at the new location. Maybe they could have stayed at that location over the course of several episodes and then moved back…? We’ll never know. Nevertheless, there’s a ton of great humor here. It was the perfect show to kick off a new season. I especially love the scene where Potter and BJ are negotiating with the “ladies” for the building, and poor Klinger’s subsequent sacrifice (which turned out to be unnecessary). Usually when an hour show is split up into 2 parts for syndication, both halves will be 22 minutes long including the opening and closing credits. So there are new opening credits for part 2, as well as an episode recap. Part 1 ran almost 23 minutes so very little is cut from that part. The original episode ran nearly 50 minutes in its one hour version. Is this the only episode to mention/show a barber’s tent? Or was that rectangular barber poll made for this specific episode? When Potter’s on the phone to the General, he says his wife won talcum powder and a carton of wings playing bingo. what the heck is a carton of wings? Is this a slam of some kind on Catholics? Thanks for the quick response I had no idea, just got the idea that it was some kind of religious slur the way he (IMHO out of characterly) specifies that she ‘won them playing bingo with the Catholics’. Glad I was wrong. Has anyone noticed the FAA required “N-number” (N12512 in this case) on the side of the helicopter in Part 1? There would normally be the last four or five digits of an aircraft’s serial number in yellow somewhere inconspicuous. If it were an Air Force aircraft, it would start out w/the first two numbers being the build/contract year, followed by the last four/five serial numbers of the aircraft. How about the silliness of them dashing around looking for a place to hide when there are buildings still there for them to hide in? I never understood that.